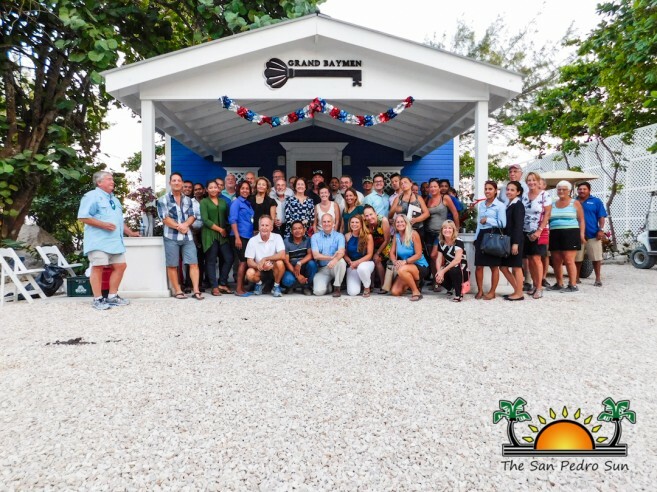 The Blue Casita Sales Office recently opened at Grand Baymen, offering visitors and residents on Ambergris Caye Belize the chance to learn more about ownership opportunities available in paradise. “The grand opening of the sales office is an exciting day for us. I first moved to Ambergris Caye in 1994, and it’s incredible to see the changes that this island has gone through over the years. A lot of folks have made a huge difference on the island, and we really are excited to be a part of its development going forward. I thank my entire team and ECI staff because it’s their work that allows Grand Baymen to be possible,” said Mike Cobb, CEO of Grand Baymen’s parent company, ECI Development. Grand Baymen has two distinct communities for future residents to choose from: an off-beach sanctuary, Baymen Gardens, and the current Exotic Caye Beach Resort, also known as the future Grand Baymen Oceanside. Baymen Gardens is currently home to 44 condos with 10 more currently under construction scheduled to open early 2017. Future plans for development include five additional buildings. Ownership options start at only US$147,000. Grand Baymen Oceanside, a new five-story waterfront resort, will officially break ground in January 2019. Owners can choose from studios, 2-bedroom units, or 2-bedroom with an owner lockout amidst a welcoming lobby/reception area, beachfront facilities and lush tropical gardens. Investment units for ownership start at only USD$225,000. Cobb explained how Belizeans will benefit from this new development, “Grand Baymen Oceanside will create several hundred construction jobs. We are building a very big, 157-room, colonial hotel accented with that ‘old-world’ charm,” said Cobb. In the same spirit of preserving the country’s heritage, ECI’s philosophy in regards to real estate development echoes their sentiment of wanting to respect and create a conscientious and sustainable development. “Our real estate development philosophy differs from others because we see ourselves as long-term members of the community. In our hotel, we are going to retain 60% of the condos ourselves. We don’t intend to sell all of the condos, put the money in our pockets and leave - we’re going to keep more than half of them because we believe in the success of this development throughout the next 10 to 50 years. We have a long-term focus that changes the way we think and believe that right, proper, conscientious, and sustainable development is good for the country,” said Cobb. Post updated November 2018 - See the exciting announcement of April 2018 regarding the important branding of Grand Baymen Oceanside. For more information on how you can become a part of the Grand Baymen community, click on this link.